Take the cold arctic air from the north, add in the moisture from the south, then mix in hurricane force winds coming in from the warmer than usual ocean and what have you got? The perfect recipe for the blizzard of 2013! Ironic that 35 years ago between February 5th and 7th, New England was hit with the blizzard of ’78! Back then, weather forecasting did not have the computer technology that we have today so no one suspected that we were about to be walloped until about 30 minutes before the storm hit. And unfortunately it hit in the middle of the day so many people were stranded on the roads and highways and couldn’t get home. It literally took weeks to clear all the abandoned cars on the roadways and for things to get back to normal. Today the hype by the media before Mother Natures shows us her fury can drive us totally nuts especially if the storm fizzles out. But it does give everyone a chance to prepare and allows people to hunker down ahead of time. Yesterday I went to BJ’s and the grocery store about 11:00 a.m. When I pulled into the parking lot at BJ’s, it looked just like the parking lot during the holiday rush! But when I got inside, there weren’t that many people there, at least so I thought, until I reached the deli department. There was a line a mile long. Guess the rush was on for not only milk and bread but bologna as well! Local channels are forecasting accumulations between 18″ and 24″ for most of MA with some areas getting as much as 36″. Snow will fall at a rate of 2″ to 3″ per hour with sustained winds around 30-40 mph, gusting to 60 to 70 mph and even higher at the coast. We appear to be right in the center of the bulls-eye for the maximum snowfall. Gulp! School and college closures were being announced yesterday, government offices are closed as are most companies and stores, and trains, buses and subways are shutting down at 3:00 p.m. All flights are already cancelled. Basically New England is shut down. Yesterday the Governor asked for everyone to be off the roads by 12 noon and just announced a ban on all non-essential travel across the state beginning at 4:00 p.m. 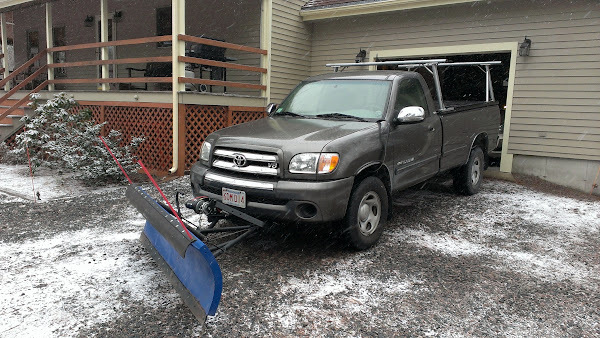 Rob installed the plow on the pickup first thing this morning, and made other preparations. Our plow is a “personal” non-hydraulic unit but has served us well over the last fifteen years. It raises and lowers electrically, but Rob has to get out of the truck to tilt the blade left or right. It’s easy to attach/detach and has it’s own dolly for storage – it even fits perfectly in a shallow cubby in our garage. It started snowing lightly about 10:00 a.m. but the worst isn’t expected until tonight. Oh joy! Nothing worse than lying in bed listening to the howling winds and thinking that at any moment a tree is going to fall and hit the house or the motor home. And I wouldn’t be surprised if we lose power but that won’t be too bad since we have a generator and plenty of gas on hand. 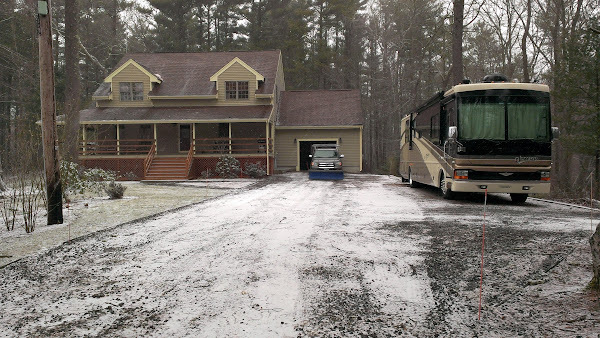 Of course we could always move out to the motorhome and fire up its generator if needed. For extended power outages, we use our 50A RV hookup as a “Main” for our portable 4000 Watt gas generator. We are very careful to shut off the grid tie main breaker before running the generator so we don’t feed any potentially lethal power back into the grid. We can then turn on selected house breakers for the critical items like the furnace, well pump, refrigerators, lights and selected outlets, so as long as we have gasoline on hand we can be pretty comfortable during a long outage. Yes, we have heat and can even flush the toilets – woohoo! In some respects, we’re glad that we are here instead of down south. It would have been quite worrisome especially if there was an extended power outage. Although we’re not thrilled at being here and the prospect of shoveling and plowing huge amounts of snow, sometimes things work out for the best. The truck/plow are ready to go and we expect to be out a couple of times during the night to try and keep up with the snowfall. Even with 4WD if the snow is wet our truck will not be able to handle 30″ all at once!